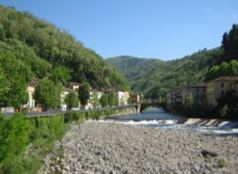 The attractive park of Villa Fiori at Ponte a Serraglio, Bagni di Lucca, by the River Lima is the idyllic setting on Sunday, 19 May, for the Festa della Colombina. Colombina means ‘little dove,’ and this festa remembers the time of the French occupation when Napoleon’s soldiers visited the area and ate at the bars. Apparently they didn’t like the local bread – it wasn’t sweet enough for their taste – so they asked for Colombo bread, a sweet bread with added candied peel and topped with sugar and sliced almonds. 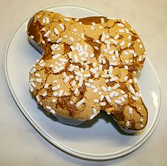 The dough is baked in dove - shaped moulds and is rather like panettone, an Italian favourite at Christmas and Easter time, the dove symbolizing peace. Visitors to the Festa will be able to eat a similar version of the bread, but topped with nutella (for those with a sweet tooth) or with prosciutto, washed down of course with a glass of excellent local wine. This is just part of the varied programme which had been prepared to make this a fun day out for the whole family. 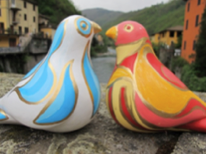 Local artist Maureen Halson has been busy creating plaster statuettes of doves which for a small fee can be hand-painted and then taken home – a favourite with younger visitors. 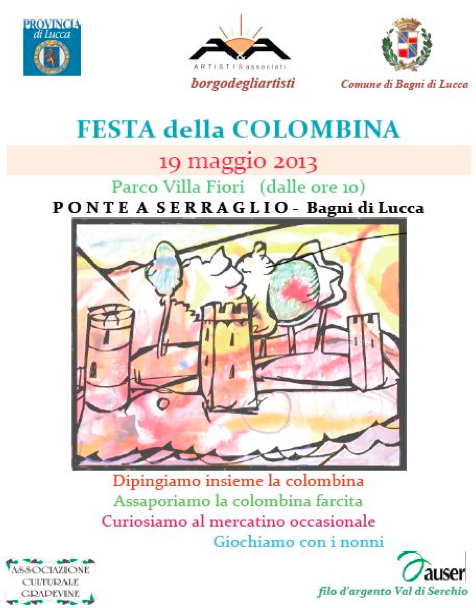 All materials will be supplied by borgodegliartisti, representing the local arts community. Australian Debra Kolkka, who lives part of the year at the Ponte, took this photograph of the finished product. 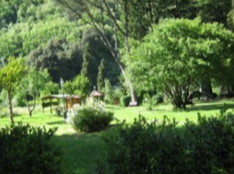 The colourful mercantino will have several stalls selling local produce, arts and crafts and plants etc., and there will be traditional games aimed at all age groups which everyone, locals and stranieri can join in and enjoy. Next year there could be a change of artistic emphasis from the literal translation of the Colombina to that of one of the stock characters found in Commedia dell’arte. This was a popular form of Italian theatre for the people, which began in the 15th century and influenced many great writers, from Shakespeare to Molière and Dario Fo, and composers from Mozart to Stravinsky. 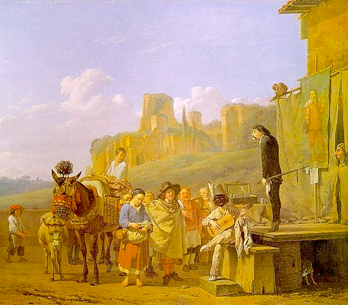 Travelling groups of players would set up an outdoor stage, sometimes performing from the back of their wagon, to provide free entertainment in the form of part-improvised plays. These would be based on a rough, usually comic story - line, (often leading to slap-stick comedy routines), with easily recognised themes such as love, jealousy, old age etc. and with established or stock characters, who would be identified by their costumes and masks and occasionally, props. The traditional plot is that of a love story, where two young people who are in love wish to be married, but one or several elders are trying, with help to thwart them and prevent this from happening. There is usually however a happy ending with all wrong doings forgiven. Many variations on this story can be found, including Punch and Judy and the English Pantomime. Colombina is a comic servant girl who is the wife of Pierrot and the mistress of Harlequin. She is seemingly the only intelligent character on stage and is the maid - servant of the ammorata, often involved in intrigue. 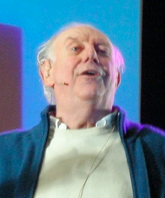 The great, still living Italian playwright, Dario Fo, whose strength lies in the creation of texts that simultaneously amuse, engage and provide perspectives, has often drawn inspiration from commedia dell’arte. His plays are open for creative additions and dislocations, which encourage improvisation and connect to the audience in remarkable ways. He has taken topics from current news, such as the rise of the Italian workers’ movement, the revolt in Chile and the Palestinian situation and his works often include a discussion between actors and audience. In this way he has been able to incorporate commedia techniques, such as farce with political issues to produce Political Theatre. His brilliant play, Accidental Death of an Anarchist is based on a real – life event, that of the so - called anarchist, Pinelli falling or being pushed from the 4th floor of a police station in Milan after being accused of bombing a bank. 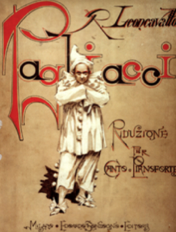 The main protagonist, the Maniac, whose role is open to improvisation, resembles commedia’s Harlequin. He doesn’t wear traditional masks but is constantly passing himself off as other people whilst he himself has no persona. However, he also has the guile and wit of Colombina. Italian composer Leoncavallo drew heavily on commedia’s stock characters and situations in his opera Pagliacci, written in 1892. It is a play within a play, in which the performers in a commedia dell’arte company find themselves depicting real-life situations, which uncomfortably resemble those of real life. One of the main characters, the scheming and unfaithful Nedda is also Colombina in the commedia troupe’s play. This popular work is often paired with Mascagni’s Cavalleria Rusticano, a one - act opera written two years previously, which greatly influenced Leoncavallo. A Taste of Tuscan Arts will be taking guests to see a spectacular production of this much loved opera in July at the Puccini Festival in Torre del Lago. The Festa, whether on a grand scale like the Carnevale in Venice or Viareggio, or a simple village affair, is a great way to learn more about Italian life and customs and is always worth a visit!